Free shipping to United States with $100 purchase from galwaydesigns. See item details below for sale terms. Please let me know which opals/birthstones you would like on your necklace. 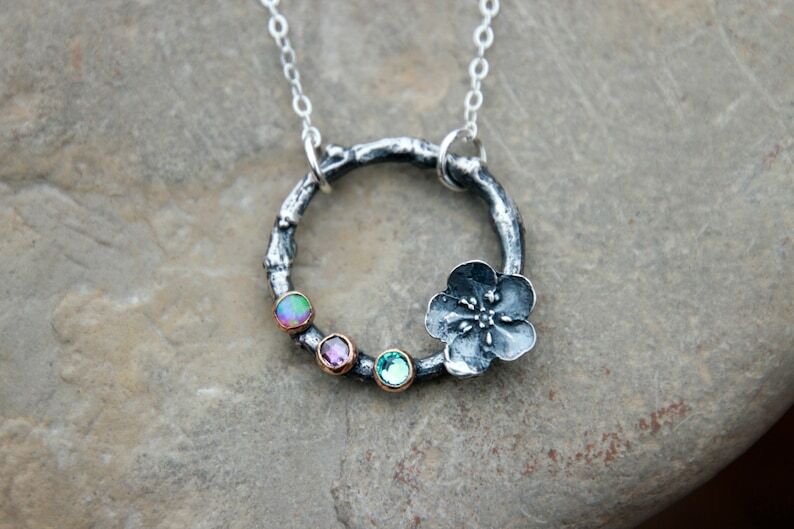 ♥Each circle has been hand cast in solid sterling silver using real twigs! These were hand cast using the lost wax technique. ~~~I have oxidized the silver to bring out the texture of the wood and really highlight every bump. 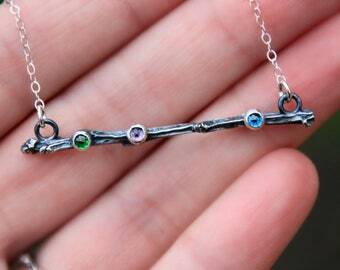 Each branch is hung on a delicate sterling silver cable chain. Please choose your length in the drop down box. ***I have added 3mm gemstones set in 14K yellow gold-filled for a pop of color against the blackened branch. If you would prefer the bezels in silver or 14K pink gold-filled, just let me know in the 'notes to seller' box at checkout. ★★★YOU HAVE YOUR CHOICE OF 2 DIFFERENT GEMSTONES: I have used one of each in the photo to give you an idea of what they look like. 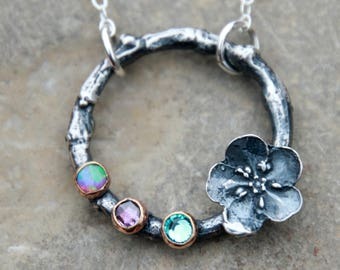 You can also mix these gemstones, like I have in the picture. These gemstones are made just for my shop to my specifications, so you will not find them anywhere else! 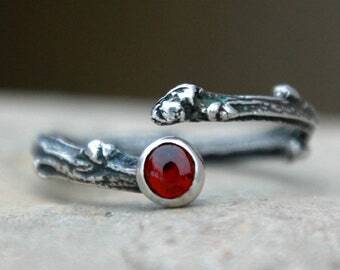 If you would prefer to have natural birthstones, please message me! Free domestic shipping on orders over $100.00. No coupon code needed! 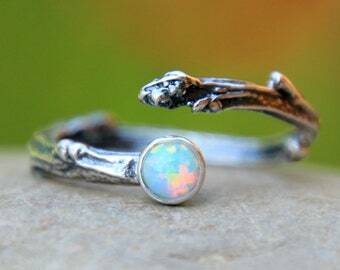 OMG, this ring is perfect. 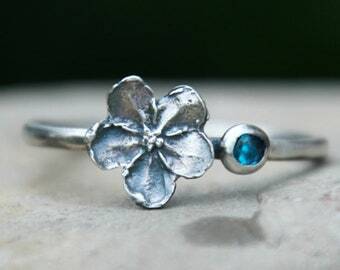 It is soo pretty with the 2 birthstones I picked out. You must order one!! Shipped fast! ~CREDIT AND DEBIT CARD CUSTOMERS - You do not need a Paypal account to pay for your items through Paypal! Choose the Paypal option during checkout. After you submit your order, click the "pay now" button. Scroll down and you will see the option to pay with credit or debit card without having to sign up for a Paypal account. Since every item is hand made to order, I do not accept refunds or exchanges, unless there was an error on my part. Please double check your ring size, as not all of my rings can be resized. I ship all packages USPS 1st class with a tracking number. In an effort to conserve and because so many of my items are shipped directly as gifts, I do not automatically print and ship an invoice with your order. I have shipped my jewelry to every continent (except Antarctica!) The US postal service is now offering tracking numbers, but not to every country. International shipping can take anywhere from 1-8 weeks. ★The Buyer will be responsible for any duties/customs/tax charges etc... that may be imposed. This is including VAT for Europe, particularly UK. Please be sure to check with your customs office to determine what these additional costs will be prior to purchasing. Customs fees are normally charged by the shipping company or collected when you pick the item up. These fees are NOT additional shipping charges and are the responsibility of the buyer. ★★★If you have the time to leave feedback, it is always greatly appreciated! If you are tempted to leave less than 5 stars, please contact me at my e-mail above or through Etsy and let me know if there is a problem with your order and how I can help. I want all customers to be 100% happy! Custom orders and variations are welcome :) If you have something in mind that you do not see in my shop, please message me and we can come up with a special piece. ~Since each piece is hand stamped and made by hand, no two pieces will look exactly the same, for example, alignment, spacing, etc... This is the nature of hand stamping and should not be considered a defect, but instead something that makes your jewelry one-of-a-kind. All of the metals in my shop with the exception of stainless steel, will tarnish over time. Body chemistry and other factors can vary the rate of tarnish greatly! It is not very common, but some people may have a reaction to rose gold, due to the high copper content in the metal. This may cause a green/black ring on the finger. This reaction is harmless to the skin and may go away with wear. Please read below to see a few tips that may prevent a reaction. I include a polish pad with every order, unless you order titanium or stainless. If you are having a reaction to rose gold, please avoid water, soap, lotion, hand sanitizer etc... If this does not stop the reaction, apply clear nail polish to the inside band to create a barrier between your skin and the metal. Use the included polish pad every time you wear it to remove any residue from the day. Once the polish pad is completely black or starts to redeposit gunk back on to your metal, throw away. ***NOTE ABOUT ALL ROSE GOLD RINGS: Rose gold solder contains dangerous chemicals, so I use 14K yellow gold solder to join the ends together, which can sometimes leave a lighter spot on the underside of the ring, that will not be visible when worn since it will be on the opposite side of the stamping. Many customers think their rose gold is coming off when they see this light spot. ~*YOUR ROSE GOLD IS NOT COMING OFF*~ Gold-filled items will NOT chip or flake off like plated gold. This lighter spot should not be considered a flaw, this is part of its natural organic beauty, and a sign of it truly being a handmade ring.